If you want to organise an inspiring course or workshop and are looking for a matching location, we would love to talk to you. 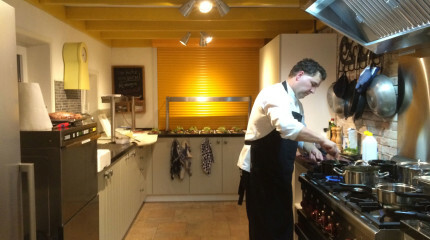 Group accommodation StrooDrie in Dwingeloo has its own, spacious course location, which can for example be used for a retreat, a yoga course, a cooking course, or another workshop or training. Whether it is a course of one day or an entire weekend: StrooDrie can do it all. Our group accommodation offers room to 30 people, divided over 12 bedrooms. All rooms have their own washing facility and mirror. The accommodation also has a spacious, modern bathroom and multiple toilets. The course can be offered in the cosy living room of the accommodation, or in the separate traing roomin. This combination is perfect for groups that want to host multiple activities at the same time. Do your own cooking or catering? StrooDrie has a fully equipped kitchen, which you can use to do your own cooking. However, our groups also often make use of a catering business to do it for them. If you want, we can give you the names and addresses of a couple of options. We'd love to share our thoughts with you. Are you thinking about hosting a special course or training, but are you not sure if StrooDrie offers the right possibilities for this? Please contact us! We’d love to share our thoughts with you. And if specific adjustments are required, that might be useful to other guests, we might be able to help you with this. StrooDrie can be an active partner in this! Do you have an idea for an interesting workshop or course, but no idea how or where to begin? Group accommodation StrooDrie might be able to help. Our gorgeous location and experience in coaching and motivating people might be just what you need. Would you like to participate in a brainstorm session? Please contact us.